I think this nomination pleases me even more than the one I made myself. When I first posted about D'Candela, there was about six months of crickets and tumbleweeds afterwards; probably my poor vocabulary and sub-standard photography skills didn't inspire LTH'ers to rush over there. But thankfully the deliciousness of the food trumped that and D'Candela has gotten the attention it deserves. Great nomination. We decided to check out D'Candela last night. They aren't the greatest but I'll add a few more pics. 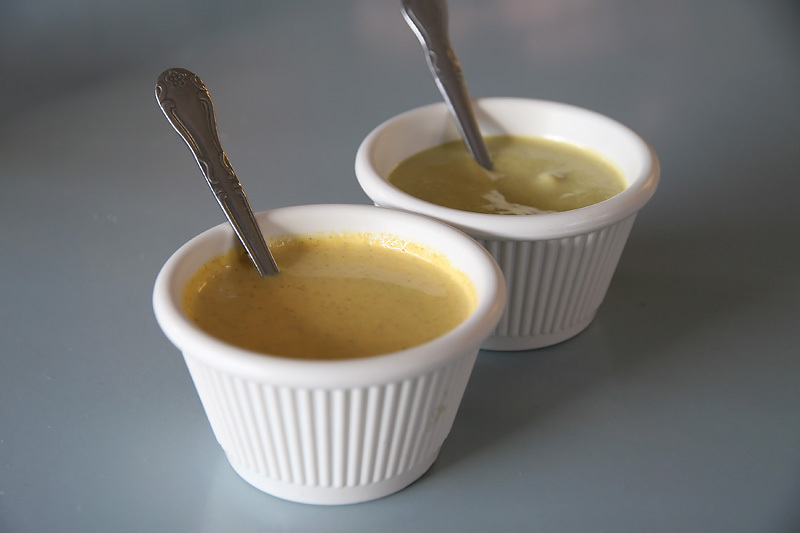 Two table sauces: the green one was described as 'only jalapeno' and the yellow one with aji amarillo (Peruvian yellow chile), mayo, "cookie", a Peruvian herb and garlic. We really enjoyed everything shown(with the exception of the fried talapia in the Jalea--not our thing) plus a half chicken and the complementary chicken soup. 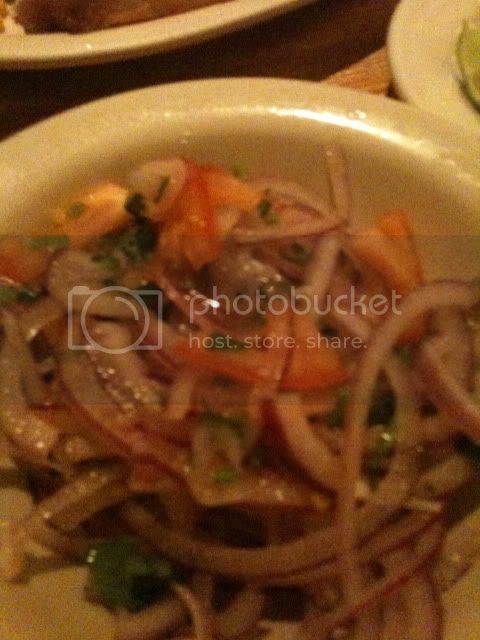 Service was very warm, nice dining area and prices are very reasonable. We'll definitely been back. I wholeheartedly support the nomination. The Boss and I shared a good meal with a few friends at D'Candela last summer. I liked it much better than she did, so we haven't made it back. This nomination made me remember that I never posted my notes or pictures. I thought the papa rellena and tamale appetizers were passable, but not great, and nobody at the table enjoyed the chewy, full-flavored beef heart. That said, you can dramatically improve just about anything with D'Candela's fantastic table sauces. I really preferred the entree course. 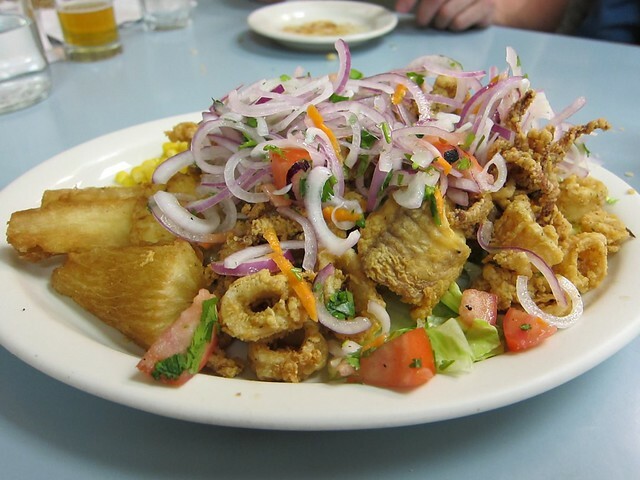 The jalea was an excellent plate of fried seafood goodness. I'm not sure whose idea it was to dump the salsa criollo on top, but I wouldn't eat the jalea any other way again. 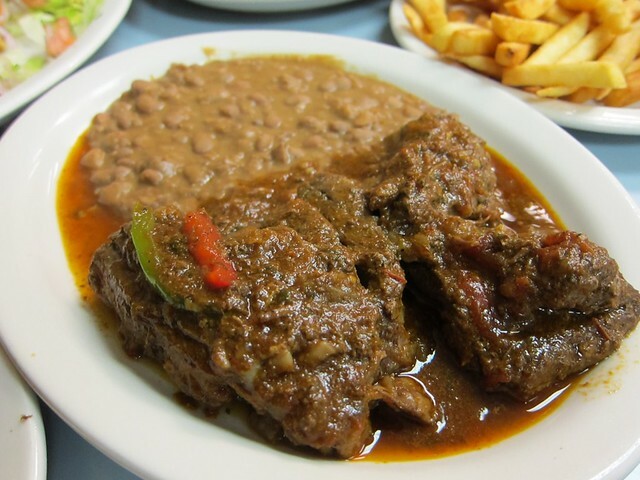 The cordero, a spicy stew of just-gamey-enough lamb in a rich brown sauce, was also very good. We tried the charcoal-roasted chicken too, but I must have been so excited to see when it arrived that I forgot to pause for a picture. It was a juicy, aggressively seasoned bird with crisp, charred skin. Good stuff. D'Candela feels like a GNR to me. I've only eaten here once, and it was carryout, but it was a great meal of chicken and maduros. The friendly waitress gave me a cup of soup to eat while I waited for my order. I still have the menu sitting on my desk for easy access. RAB - you probably scarfed down that delicious chicken so fast that you missed a detail that I now point out only so that others don't go with the wrong expectation. As terrific and aggressively seasoned as the birds indeed are, the skin is not crispy - at least not ever in the 20 or so times I have had it. We decided to hop down here from the burbs tonight. Kennyz spotted us on his way out of there. 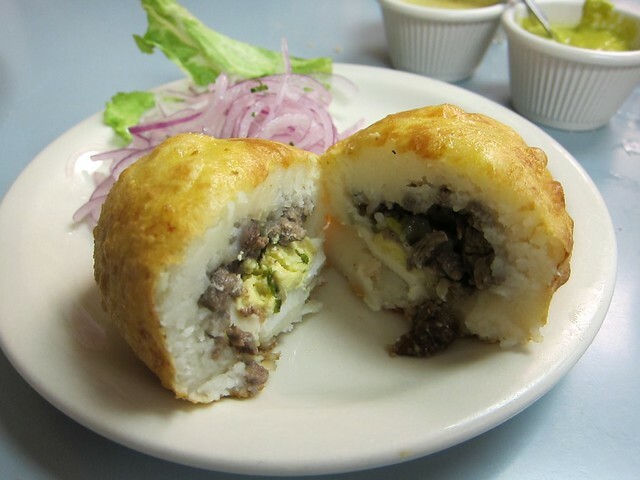 Papa Rellena: delicious starch bomb, filled with meat, olives and hard-boiled egg. The pickled red onion is a nice foil for the grease and starch. Tamale: Not a hit with me. The masa is one of the smoothest I've ever had (the best thing about it), but very, very salty. It reminded me a bit of hot dog stand tamales in flavor. Also accompanied by the pickled onions. 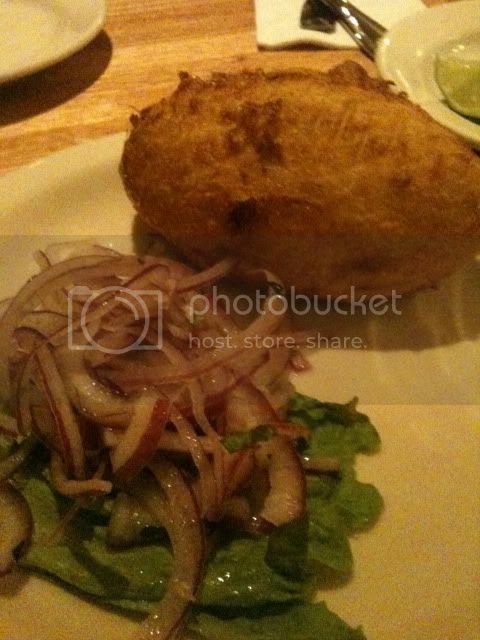 Empanada: Wonderful pastry crust with fillings similar to the Papa Rellena. Rotisserie Chicken: Fantastic smoky flavor, the skin is not crisp, but thin and delicate, all the fat rendered out into the bird. 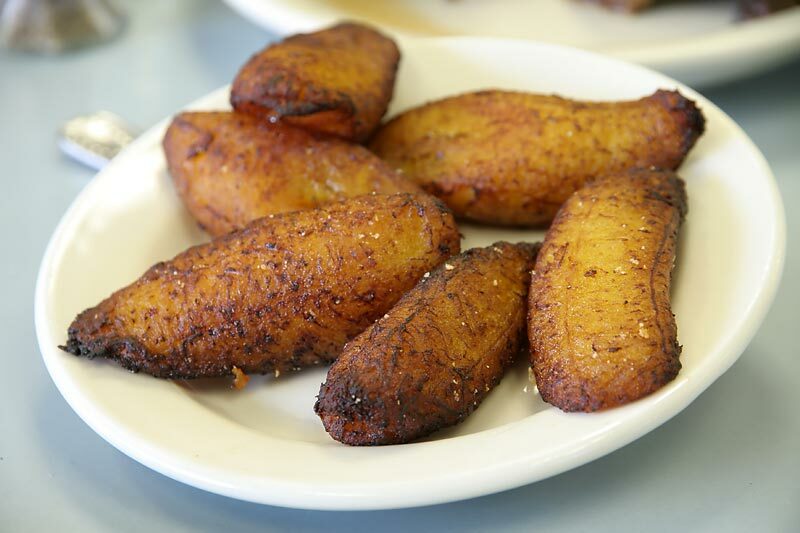 Side dishes: Plaintain/maduros: nice texture, the sweetness works well with the green salsa. Casava "fries": crisp, crunch and creamy center. Salsas: The green one is now one of my favorites -- very close to the long-gone Taqueria Morelos in Prospect Heights -- green, creamy, and hot. The yellow on is sort of a dijonnaise, but the waittress couldn't tell us anything about it except it's "only Peru." I'll definitely be back -- if for no other reason than it's just up the block from Village Discount, one of the better thrift stores in Chicago (came out with three Hawaiian shirts that fit me for about $5). A couple of weeks ago, Kennyz mentioned to me how much he enjoyed D'Candela, which is very near his residence. I'd never been there and had been thinking about it checking it out when Kenny nominated it for a GNR. Once that happened, I decided -- like a few other LTHers -- to check it out yesterday . . .
As was mentioned upthread several times, these complex and balanced salsas were delicious. They both delivered a nice level of heat. I preferred the green one. Fantastic, flavorful and free. 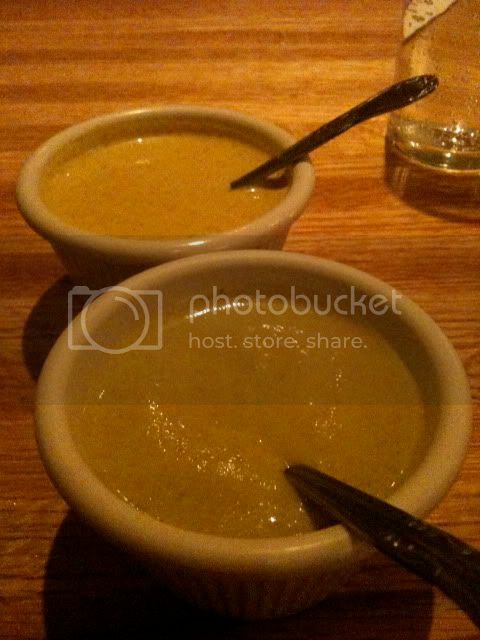 This complimentary cup of herbaceous soup was a great pre-cursor to our meal. These seasoned and grilled veal hearts were phenomenal. The flavor was clean, mild and beefy, and the texture was absolutely perfect; a little initial chewiness but no sinew at all. As good as it looks. Kenny's right -- the skin isn't crispy but who cares?! I loved this well-seasoned bird and how moist it was. Even the white meat was juicy, which is a testament to how well it was prepared. Best of all, this wasn't a salt bomb, like so many rotisserie birds can be. I can't remember ever having a better rendition in Chicago. While fried plantains are just not my thing, these were perfectly cooked, with a lightly crispy exterior and creamy interiors. 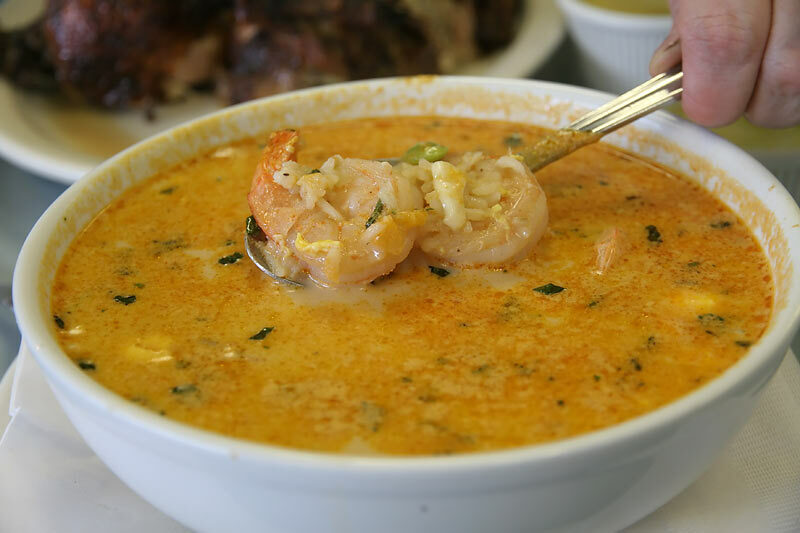 This gigantic bowl of "shrimp chowder soup" -- priced at $14.50 -- is clearly intended to be a meal on its own but after reading Kenny's comments about it, we had to try it. It was sensational, with a rich, creamy and slighty briney broth, and bits of gently-cooked egg throughout it. As good as those components were, the star of this dish was -- triumphantly so -- the shrimp. They were really fresh and cooked perfectly; just until they were tender. Overcooked shrimp is such a ubiquitous bummer and I worried that they might show up here. Instead, the dish showcased shrimp that could not have been prepared any more perfectly. I'm so glad Kenny nominated this place for a GNR because it precipitated my visit. Now that I've been to D'Candela and enjoyed it so much, I know I'll be hitting it on a regular basis. The chicken, the veal hearts and the shrimp soup were all excellent and I much as I want to have them all again, I can't wait to work my way through the rest of the menu. Lunch at D'Candela today was fantastic. Started with the gratis chicken soup which was a tasty way to start things off. The stuffed mashed potato was good, but I wasn't as nuts about it as I thought I would be. The chicken was the real star of the show here. Juicy, full of flavor, with perfect skin (there's no reason for the skin to be crisp, it's perfect the way it is). Fabulous fried plantains and yucca (the latter pairing perfectly with the table salsas). We also enjoyed a plate of the beef fried rice, which is probably now my favorite fried rice in the city. Great food, exceptionally nice people who I think would be genuinely appreciative of the recognition...this is a quintessential GNR. Glad to hear people are enjoying D'Candela as much as I do. Whether or not it garners a GNR award, it's great to see people patronizing the hard working, very nice people who run the place. Josh is right about the fried rice, which I tried for the first time today - nearly greaseless and full of zippy flavors and varied textures. I know about the Asian influence on Peruvian cooking, but I was still surprised by just how Chinese this dish seemed, with hefty ginger and scallion at the forefront. NB for D'Candela regulars who haven't been there in awhile (and for new potential visitors) - the owners have expanded into the space at the corner, so they now have the storefront under the awning in Ronnie's picture as well as the one directly to the north, which has been turned into an adjoining dining room. While the old one is still the same utilitarian, brightly lit, ugly-tiled cafeteria-style room, the new one has beautiful new hardwood floors, dim lighting, and a much more serene feel to it. Kennyz wrote: Josh is right about the fried rice, which I tried for the first time today - nearly greaseless and full of zippy flavors and varied textures. I know about the Asian influence on Peruvian cooking, but I was still surprised by just how Chinese this dish seemed, with hefty ginger and scallion at the forefront. Kenny, I think this is what you are hinting at, but Chinese food has gained a significant foothold in Peru. The Peruvian-Chinese restaurants you see all over the tourst-y towns I visited are known as chifas. According to Wikipedia, there are over 6000 of them in Lima. More to the topic, however, I really enjoyed my one visit to D'Candela. The chicken isn't complicated, but it also happens to be absolutely delicious. I also very much enjoyed the chicken soup as well (all places specializing in chicken should have soup this good, but they don't). I also have enjoyed the papa rellena, anticuchos, and jalea. I agree that the sauces are also fantastic. I am happy to see that they are doing well enough to expand and I heartily support the nomination. Kennyz wrote: NB for D'Candela regulars who haven't been there in awhile (and for new potential visitors) - the owners have expanded into the space at the corner, so they now have the storefront under the awning in Ronnie's picture as well as the one directly to the north, which has been turned into an adjoining dining room. While the old one is still the same utilitarian, brightly lit, ugly-tiled cafeteria-style room, the new one has beautiful new hardwood floors, dim lighting, and a much more serene feel to it. We were offered to sit in the new room to the north but I wanted the daylight for my pictures, so we sat in the original room (it also seemed more lively in there during our visit). I took a peek into the new room and it's quite nice. Maybe next time, we'll sit in there. 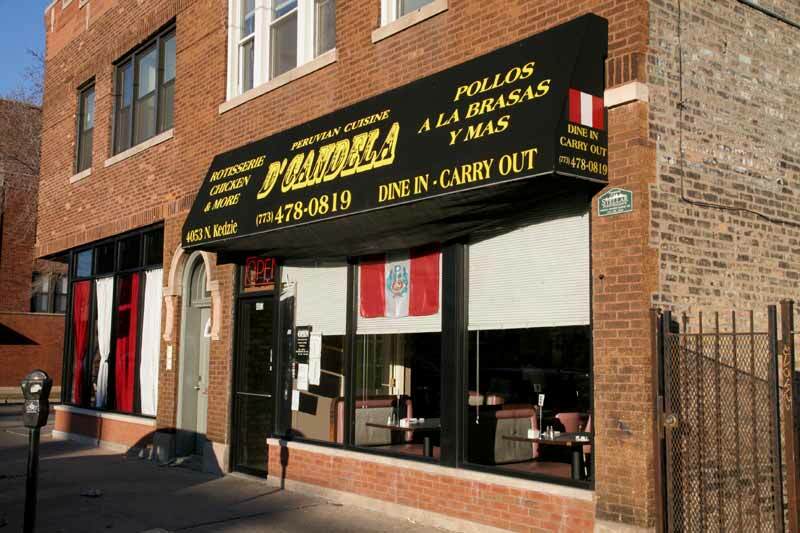 2) The nomination mentioned the dearth of south american restaurants in the GNRs -- I know I passed a couple others along Irving Park -- Columbian and Chilean --tell me more! 3) I forgot to mention the chicha -- great drink, a good foil for the spicy salsa. It's like ethnic coolaid, with strong flavors of cinnamon and something floral. The service was terrific too. This is the sort of place that should get patronized and supported, whether or not it gets a GNR. We didn't think this place was as flawless as everyone else did. - No soup for us, either, even though plenty of tables around us got it. - There were kids running around uncontrolled and none of the staff seemed to care. - We were essentially ignored for about 30 minutes after our food was boxed up, and I had to wave down the waitress for our check. So while we didn't think the service was anywhere near terrific, the food was good. The chicken is about as good as chicken gets, and the lamb stew was no slouch either. Still, the service issues leave me hesitant to return. JoelF wrote: ...The nomination mentioned the dearth of south american restaurants in the GNRs -- I know I passed a couple others along Irving Park -- Columbian and Chilean --tell me more! 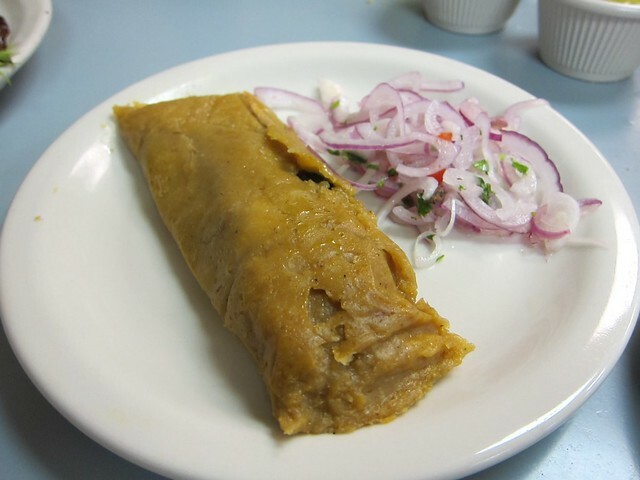 The Chilean place you passed was Rapa Nui, where the excellent humitas would make up for the lackluster tamale you had a D'Candela (I agree that D'C's tamales are not a highlight). - a nondescript 24 hour coffee shop with a name I've never known near the NE corner of Irving Park and Kedzie, where most of the menu is big plates of greasy spoon fare, but there's always one tasty Ecuadorian special from the cook's homeland listed on the whiteboard in the back. 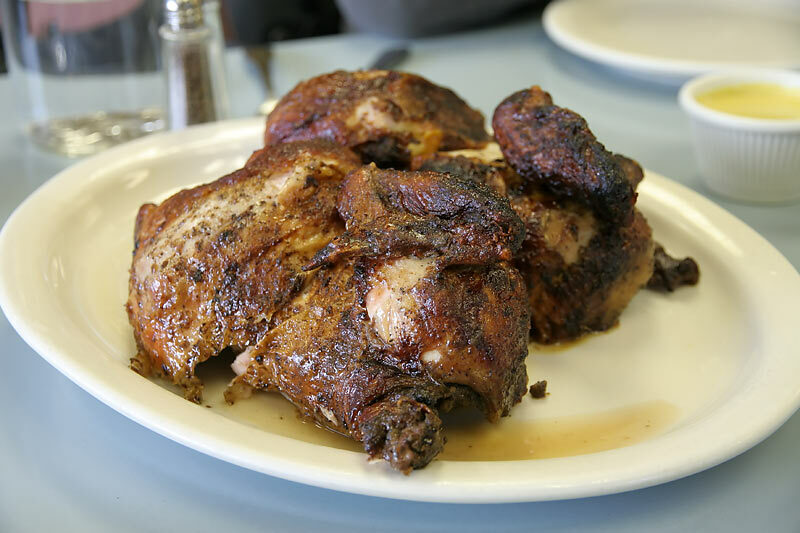 - Fina Estampa on Montrose east of Sacramento, for tasty Peruvian rotisserie chicken that's not quite up to the D'Candela Standard, though the ultra-divey strip mall setting does have appeal. There are surely others I'm not thinking of now. Sorry, one of those was probably mine. She's just started becoming self-mobile, and she has a hard time keeping still. Always has a great time at D'Candela. geno55 wrote: We were essentially ignored for about 30 minutes after our food was boxed up, and I had to wave down the waitress for our check. They do not bring the check until you ask for it, as doing so is considered rude by many people from their homeland and others. Kennyz wrote: Sorry, one of those was probably mine. She's just started becoming self-mobile, and she has a hard time keeping still. Always has a great time at D'Candela. No, this was around 5pm on Saturday. I believe you were there later, based on previous comments. Kennyz wrote: They do not bring the check until you ask for it, as doing so is considered rude by many people from their homeland and others. Thanks, I didn't know this, but it would have been nice to stop by the table and check in to provide the opportunity to ask for the check. Stopped in for takeout on my home tonight - chicken, maduros, and yuca frita tasty as always - and noticed a sign on the counter stating that D'Candela is now open 7 days a week. Finally made it to D'Candela . . . but I didn't love it. We started with the papa rellena and this was definitely my favorite item. In fact, I was amazed just how damn good this potato could be, but the lightly crisp coating, the creamy mashed potato, the tasty meat/olive/egg filling paired with the tart onions made for a perfect beginning to the meal. It was at this point of the meal where I was getting incredibly excited for what would come. But unfortunately, I felt mostly let down. We also had shrimp fried rice. I thought it had a nice combination of ingredients, including some decent sized shrimp, and it wasn't the least bit greasy. However, too much ginger overpowered the other flavors, ruining what otherwise might have been a really nice dish. Finally, the chicken. Let me start by saying I loved the side of maduros. And I'll also say that the chicken was very moist. But I found the seasoning to be too thickly laid on in some spots. I had a couple bites where I got clumps of the seasoning mixture and those bites were way too salty. Also, I just didn't find the seasoning to be to my liking -- too assertive for me. But that might be a personal taste issue that I can't hold against D'Candela. I'll probably return to try some more things since I really loved the papa rellena and the maduros, but D'Candela just didn't do enough for me. Another first-timer here. Ordered to go--offered and accepted a soup while waiting. Very nice--noodles a bit soft (and yes, I was served noodle soup, not rice) but delicious broth and nice chunks of chicken. Since I was taking to go, I decided to forgo anything that wouldn't survive a car ride (papa rellenas, tostones, yuca frita, jalea--next time!) and kept it simple. Shrimp chowder and a whole chicken. Shrimp chowder was wonderful--as described above--delicately creamy, perfectly cooked shrimp and egg (even after the extra 20 minutes in hot broth), light hand with the seasoning--tasted really fresh and comforting. I enjoyed the chicken as well. I can see how people may be put off by the salt--but disagree about the flavor being overly aggressive--a bit less salt and the garlic, oregano and whatever else is in there would have popped even more and for me, that would have been a good thing. Enjoyed an occasional dip of the chicken in the green salsa--I'm sure the potato or yucca fries would have been an even better combo. There is no question that the chicken was juicier, fresher tasting and more flavorful than the typical rostisserie bird I'm unfortunately accustomed to. And the best part is I have enough food for at least 2 more meals--probably 3. Not bad for $26! Looking forward to a return trip to eat in and try more of the menu but based on what I sampled, seems like a GNR to me. And for those of you looking to avoid the crowds, try stopping in at 6:30-7:00ish on a Thursday night--I was the only one in there and my order was up in under 10 minutes. Fair enough. They do have a heavy hand with cumin, which I think is the most dominant flavor in the chicken. Thankfully, I really like cumin. But let's forget about the damn chicken for a minute and get back to this papa rellena, which in my opinion is getting a little lost in the shuffle here. I was raised to love knishes. I later developed a love of empanadas. The papa rellena combines the very best of each of these dishes. It just goes to show you what can happen when two cultures meet and cook together! 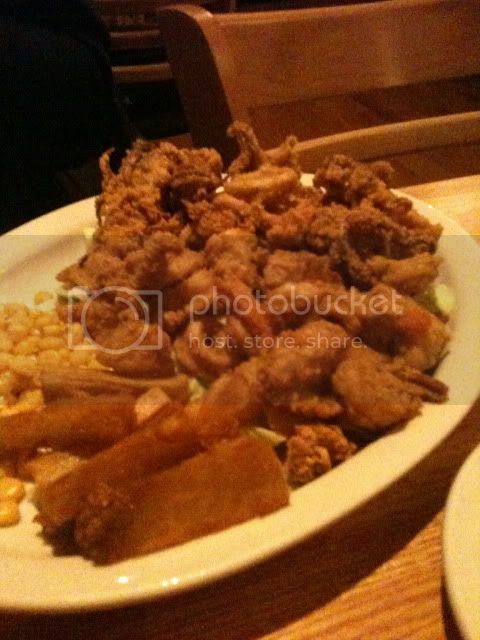 We ate once at D'Candela back in the fall, but they had been out of chicken (! ), and even though we liked the restaurant very much we didn't think we could judge the place without trying its specialty. We remedied this problem last night. The chicken was excellent: juicy, aggressively seasoned, and wonderful with the two table sauces and the fried sweet plantains. On the recommendations here, we also tried the shrimp chowder, which was excellent (I can't describe it better than Ronnie does above). 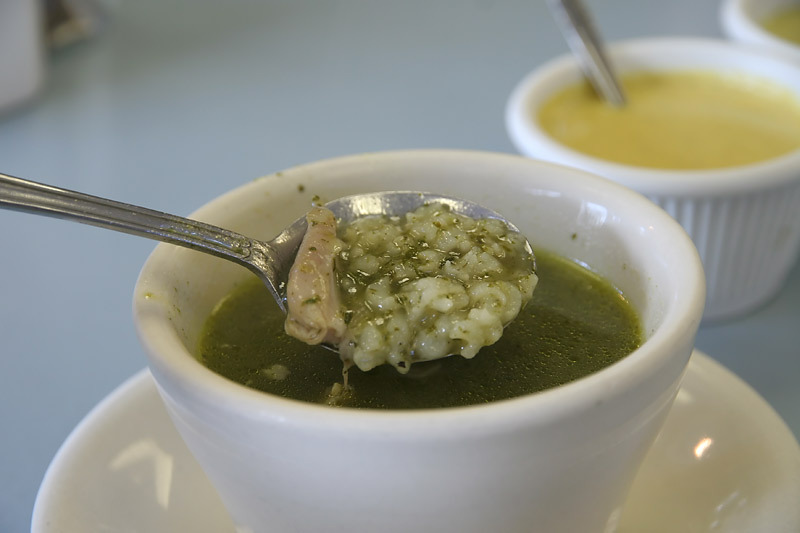 We also received the gratis chicken (rice) soup, despite ordering that gigantic bowl of chowder. (Our waitress did giggle at us that she thought we were ordering too much food. Hah! The three of us took home one piece of chicken.) 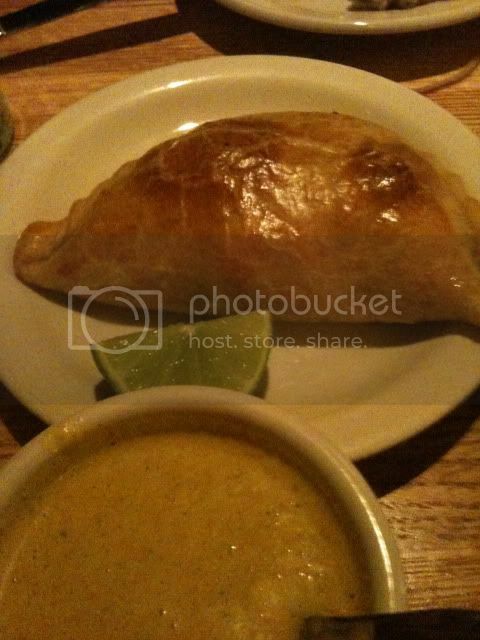 At our last visit, we had really enjoyed the empanadas, and they did not disappoint this time either. The empanadas are terrific light dough pockets with a crumbly (in a good way) beef and raisin filling--not greasy or drippy but yet moist. On our previous visit, my son ordered the Bistec a lo Pobre, which was a huge hit. If memory serves, the dish is marinated sauteed steak with rice, fried egg, and maduros, and he's a sucker for fried eggs on his meat. I can't remember all the details, but I know we liked it better than the same dish at Taste of Peru. The place saw a steady stream of Spanish-speaking customers while we were there. We sat in the original part of the restaurant , which was a bit cold, but the service was warm and the food delicious. Our family votes yes for GNR. I asked about the green sauce (in what little Spanish I could muster) and was told that it has only 2 ingredients: jalapenos and oil. So it's basically an aioli / emulsification, but with seeded chiles instead of garlic. Sorry to divert but...as discussed here before, the addictive Peruvian/Ecuadoran green table salsa, commonly just called "aji", typically has a bunch of seemingly unusual ingredients. Common ones include lettuce, feta cheese, breadcrums, and mayo. The "real" stuff uses greens called huatacay which can be found here in paste form from time to time. I believe it is also called Mexican marigold or black mint. While the aji at D'Candela might truly be just jalapenos, that seems unlikely. JeffB wrote: Sorry to divert but...as discussed here before, the addictive Peruvian/Ecuadoran green table salsa, commonly just called "aji", typically has a bunch of seemingly unusual ingredients. Common ones include lettuce, feta cheese, breadcrums, and mayo. The "real" stuff uses greens called huatacay which can be found here in paste form from time to time. I believe it is also called Mexican marigold or black mint. While the aji at D'Candela might truly be just jalapenos, that seems unlikely. Can you refer me to the discussion you mentioned? I totally missed it if it was in this thread. Your definition of typical is very different from mine. At its most basic and common form, aji in the Andean countries is nothing more than peppers, either fresh or reconstituted, pureed with a splash of water. The waitress was careful to point out that oil is used to get that creamy texture, although I do detect a very slight hint of garlic. 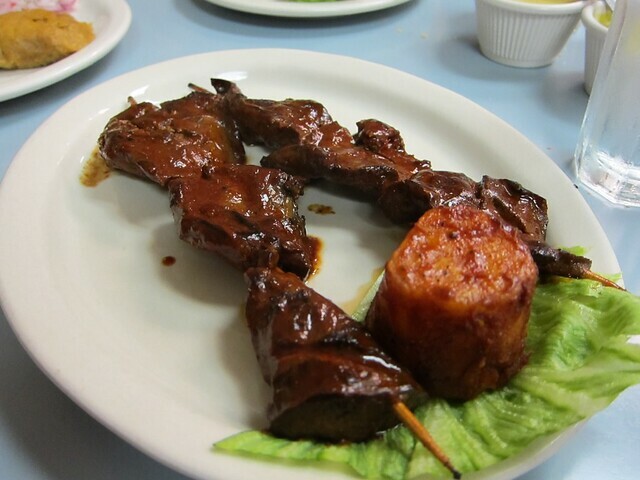 Huacatay has a very strong flavor, even in small doses, that can easily overpower things such as yuca and potatoes. It is used for very specific dishes with equally strong-flavored components, but would typically not be used in an all-purpose table sauce. Aji is the salt/pepper/ketchup of the Andean table and is traditionally made as simply as possible. Anyway, I haven't shared my thoughts on this nomination: Two thumbs up. I made my way here earlier tonight. I was eating with my brother so I had to stop in and take the order to go so it was going to be the obvious selection of the chicken, we did a whole one with two sides which was $13.50. 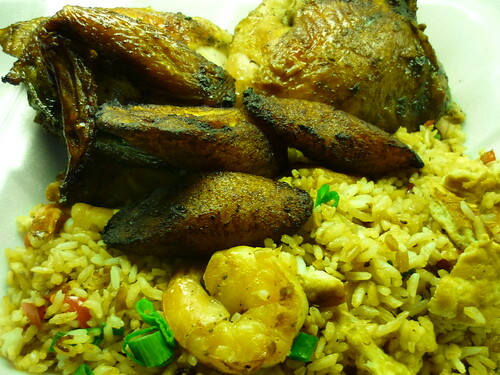 Also to go with that we got the aforementioned Peruvian shrimp fried rice. The original dining room where you enter and order is way different from the new dining room which had a large Latin family get together around 7:30 when I stopped in. It was great to see one of the cooks lugging around a very large bag of charcoal as I waited for my order and you could smell the charcoal burning in the waiting area, I also got the free cup of soup, very nice. So even before paying for my to go order we already had a couple good things going. The lady who took my order was very nice and made sure I knew what everything was and gave me four sides of the green sauce to go with it. My car smelled lovely on the ride home. When I got back I just took half of the chicken and threw it in the fried rice container while throwing half the rice into the chicken container since we were eating for two. I threw in the side's of plantains into each container and split the pinto beans and we were good to go. I'm a sucker for the Chinese fusion cuisines especially the Latin and Caribbean variations and it was my taste for both some sort of chicken and also fried rice that made D'Candela my choice for tonight since it's time was coming sooner than later anyway. I thought the rice was pretty damn good. Like others have mentioned it wasn't super greasy and would really benefit from some bacon or ham thrown in the pan firsthand but I liked everything else about it. I thought the ginger and sauteed peppers in it were well rounded and the shrimp were nice sized and they gave you your due, at $15 this dish easily feeds two if not a few. The chicken was everything described by those who declared it some of the bast damn rotisserie chicken they ever tasted. This bird was full of flavor and right up my alley. I look forward to trying some beef dishes, great little place. Much deserved, put another GNR on the board. The greener, hotter one is jalapeno-based. Can't recall if this is also referred to as aji. I always ask for both. things up and I imagine the quotidian Andean table salsa might be pureed chiles. Seems reasonable. But that's not usually what comes alongside here. I also recognize that aji just means chile. The discussion I referred to took place on the board some time back, probably more than once, when posters were wondering what was in the delicious creamy green sauce often served with the bread at Peruvian spots. NB, this might be a rare item in Peru but seems commonplace in the US at Pervian chicken joints (often minus the black mint which is expensive and pehaps an acquired taste). Could be linked to the Los Angeles area chain Pollo Inka, whose recipe for aji (what they call it) is an open secret and involves mayo, bread crumbs and iceberg lettuce. Ditto for the NY place Pio Pio as i understand it. Paz. So, like I said, sorry for the diversion and thumbs up. PS: Good thread on the issue, devoid of my own thoughts as it is, and with links to other discussions and recipes. Just stopped in and - yeah - Luis (whom I met for the first time) calls 'em both aji. The more complex, less picante one definitely has a big herbal note. I'm not sure I have any idea what huacatay tastes like, but it you'd asked me to guess what was in it without having read this thread, I'd have bet good money that there was lots of dill. 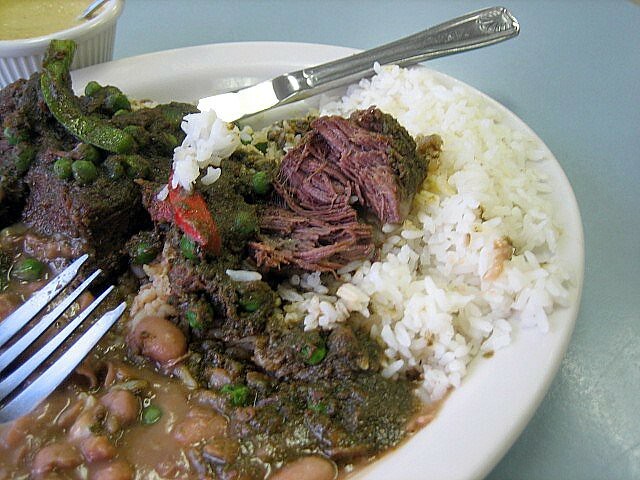 I had the seco de carne on this visit, which is made with beef at D'Candela. 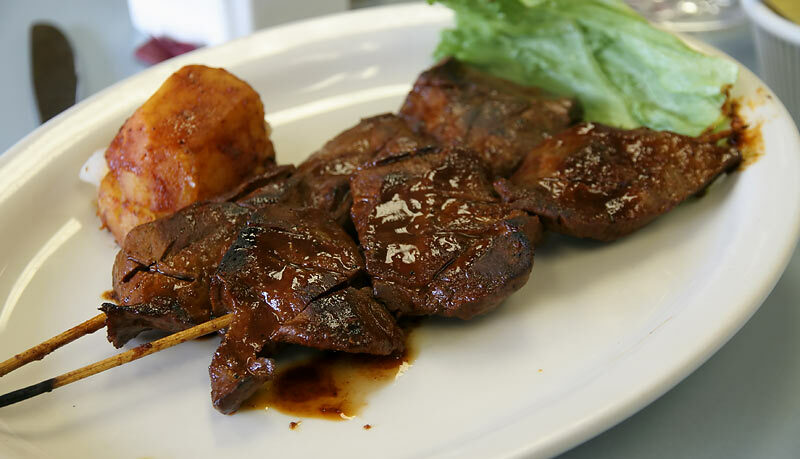 It's a terrific version of the dish, with meat that's been cooked to a perfect balance of chewy and tender, and a real beefy flavor. At first I expected the sauce to have more heat based on my experiences with other secos, but this mild, cilantro-heavy stuff is very good nonetheless. I love D'Candela, support it for GNR, but am annoyed beyond words that posting on this thread not only reminded me of this, but I now can't get the song out of my head. D'Candela, count me a fan!